We love it ! Just open the jar and spoon it onto your freshly drained pasta. It also mixes well into lots of other savoury dishes and into the bargain pistachio nuts are really healthy for you full of vitamin B6. 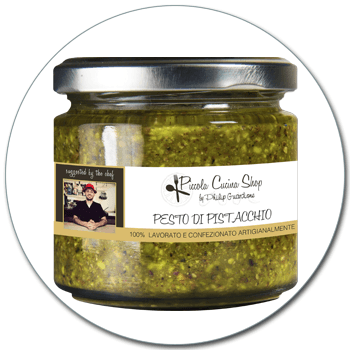 This specialty pesto is an easy to use, ready-made condiment ideal to match any quirky pasta dish, meat or fish based, or simply spread on toasted bread. Storage: store in a cool, dry place. Once opened, keep refrigerated and consume within one week.